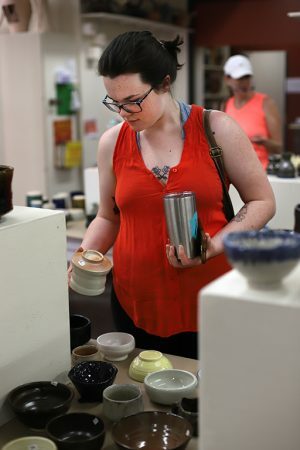 To celebrate Mother’s Day, help our students make the work that they make, and need to buy something for their mom, the ceramic department is hosting its 12th annual ceramic sale May 10-14, 8 a.m.- 6:30 p.m. in the Fain Fine Arts Center ceramic studio. All proceeds will go back to the ceramics department. 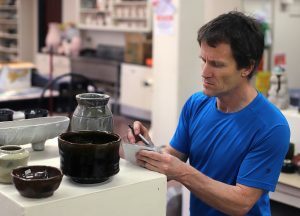 Hilton, said it was hard to say how many people would come to the ceramic sale. Like all sales, the best items available can go fast but, “not that fast” according to Hilton. “We run out of the best things but not that fast. I mean, there’s plenty of stuff. Every surface in this studio plus some will be covered in things for sale, like any area that’s flat will have stuff on in. So, there are-I’m guessing 10,000 pieces that will be on tables and counters,” Hilton said. Tiana Szymanski, art education freshman, did not create any work for the sale. For Mother’s Day, Szymanski stated she typically buys her mom flowers. She also thinks it is “awesome” that the proceeds will go to the ceramics department. Chloe Dewberry-Hanssen, art freshman, agrees with her. 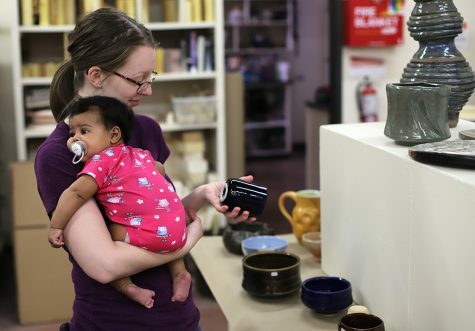 “It’s really fantastic” and helpful toward her as a student taking ceramics next semester. For mother’s day, Dewberry-Hanssen plans to give her a mother a “little frame” of a family portrait including her and her sister.